For the town of the same name in New South Wales, Australia, see Seaham, New South Wales. Seaham is a small town in County Durham, situated 6 miles (10 kilometres) south of Sunderland and 13 miles (21 km) east of Durham. Its parish church is one of the 20 oldest surviving churches in the UK. The town grew from the late 19th century onwards as a result of investments in its harbour and coal mines. The town is twinned with the German town of Gerlingen. The original village of Seaham has all but vanished; it lay between St Mary's Church and Seaham Hall (i.e. somewhat to the north of the current town centre). The parish church, St Mary the Virgin, has a late 7th century Anglo Saxon nave resembling the church at Escomb in many respects, and is one of the 20 oldest surviving churches in the UK. The marriage was short-lived, producing as its only child the mathematician Ada Lovelace, but it was long enough to have been a drain on the Milbanke estate. The area's fortunes changed when the Milbankes sold out in 1821 to the 3rd Marquess of Londonderry,  who built a harbour, in 1828, to facilitate transport of goods from locally encouraged industries (the first coal mine was begun in 1845). However, this harbour later proved inadequate to deal with the millions of tonnes of coal and the 6th Marquess commissioned engineers Patrick Meik and Charles Meik to reclaim land and extend and deepen the dock. It was officially opened in 1905. The harbour is of particular interest because it consists of a series of interconnecting locks, rather than the more typical two wall construction. As early as 1823, the 3rd Marquess had approached the architect John Dobson with a view to his drawing up plans for a town to be built around the harbour. Dobson did so, but the planned approach foundered for lack of funds, and the town instead grew in a more piecemeal fashion. To begin with, the town was itself called Seaham Harbour (to differentiate it from the ancient village); in time, though, the settlement as a whole came to be known as Seaham. In 1928, production started at the last town colliery to be opened, Vane Tempest. By 1992, however, all three pits (Dawdon Colliery, Vane Tempest Colliery and Seaham Colliery – known locally as "the Knack") had closed, a process accelerated by the British miners' strike and cheap coal imports from Eastern Europe. The pit closures hit the local economy extremely hard, and Seaham sank into a depressed state in the 1980s and 1990s. Seaham Colliery suffered an underground explosion in 1880 which resulted in the loss of over 160 lives, including surface workers and rescuers. Many local families were affected by the tragic loss of eight men and one boy in the 'Seaham Lifeboat Disaster', when the RNLI lifeboat, the George Elmy, foundered on 17 November 1962. To commemorate the event, the new coast road was named George Elmy Lifeboat Way. An electoral ward with the same name exists. The population of this ward taken at the 2011 census was 8419. Seaham has fine beaches and transport links to the eastern coast. From 2001 most of the Durham coastline was designated as a "heritage coast" and Seaham beach was entirely restored. In 2002 the Turning the Tide project won, jointly with the Eden Project, the prize for Outstanding Achievement in Regeneration in the annual Royal Institution of Chartered Surveyors awards. Seaham Hall is now a luxury hotel and spa. In homage to the town's link to Lord Byron, the new multimillion-pound shopping complex, which now includes an Asda supermarket as well as Argos and Wilko stores, is named Byron Place. It aims to revitalise the area, using the successful redevelopment of the central shopping district of neighbouring town Peterlee as a benchmark. Asda officially opened on 3 September 2007 and the rest of the shopping centre opened in November 2007. In 2006, a survey conducted by Halifax revealed that Seaham is the top property price increase hotspot in England and Wales as average prices rose by 172% since 2003. The average price of £117,266 is still, however, well below the national average. It is believed this surge has been greatly helped by regeneration work in the area, and in particular the new housing estate East Shore Village, built on the site of the former Vane Tempest colliery. Today, the town has a population of around 22,000, and is served by Seaham railway station, which lies on the Durham Coast Line, running from Middlesbrough to Newcastle, via Hartlepool, Stockton and Sunderland. Seaham has one secondary school, without a sixth-form, called Seaham High school. Previous to 2016, known as Seaham school of Technology. The rich mining history of the town was highlighted in the 2000 film Billy Elliot, which was set during the 1984–85 UK miners' strike in the fictional County Durham town of Everington but which displayed characteristics particular to East Durham pit communities such as Seaham and Easington Colliery. Both towns feature as locations in the film, notably Dawdon Miners' Club, into which Elliot's dad runs when he learns his son has won an audition at dance school. Elliot's "angry dance" scene takes place in Dawdon between Embleton Street and Stavordale Street West. The opening scene in Alien 3 (1992) was filmed on Blast Beach, at Dawdon, released 1993. The town has also served as a location for the BAFTA nominated film Life For Ruth (1962) starring Janet Munro and Patrick McGoohan. The town appeared in the BBC Three sitcom Live!Girls! present Dogtown which premiered on the channel in autumn 2006. According to the Sunderland Echo (11 February 1999), scenes from Saving Private Ryan (1998) were also going to be filmed in Seaham, but government intervention moved production elsewhere. According to Tom McNee's 1992 portrait of the town The Changing Face of Seaham: 1928–1992, St. John's parish church was used as the setting of a 1985 service recorded for BBC Radio 3. Also, a two-part Channel 4 documentary profiled the town in 1991. To the south, beside the road to Dalton-le-Dale, are the remains of Dalden Tower, comprising the ruins of a 16th-century tower and fragments of later buildings. The harbour itself may be said to be the principal landmark of the nineteenth-century town; though the Londonderry Institute in Tempest Road (1853 by Thomas Oliver) with its monumental Greek-style portico provides something of a glimpse of the Marquess's original vision for the town. Of a slightly later date, the former Londonderry Offices on the sea front once served as headquarters for the mining and other businesses of the Londonderry family. A statue of the 6th Marquess stands in the forecourt. Also dating from an early stage in the town's development is the town-centre church of St John, Seaham Harbour (1835–40). For the very much older St Mary's, Seaham, and its neighbour Seaham Hall, see above. For just over a hundred years the harbour was towered over by a 58 ft (18 m) lighthouse on Red Acre Point immediately to the north. Erected in 1835, it displayed a revolving white light above a fixed red light. It was decommissioned in 1905, when the harbour was expanded and the current black-and-white striped pier-head light was constructed. Red Acre lighthouse was left standing, however, to serve as a daymark, until 1940 when the whole structure was swiftly demolished in case it should serve to assist enemy navigators. A steel statue, 1101 (locally also known as Tommy) by local artist Ray Lonsdale, commemorating World War One and initially erected temporarily for three months, was the subject of a local fund-raising drive in 2014 to retain it on the town's seafront. Between 1929 and 1935, the Member of Parliament (MP) for Seaham (the defunct constituency which covered the area now renamed Easington) was Labour Prime Minister Ramsay MacDonald. Easington constituency has only ever returned Labour candidates to Parliament, and at the 2010 General Election, Labour candidate Grahame Morris was elected with a majority of 14,982 votes. Seaham has also produced several able footballers, some of whom have gone on to play for the local team, Sunderland. Terry Fenwick and Brian Marwood, moreover, played for England, with the latter, on retirement from football, working as a commentator for Sky Sports. 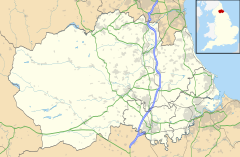 Paul Gascoigne also lived in Seaham in the late 1990s, while playing for Middlesbrough. ^ a b "Area: Seaham (Parish) Key Figures for 2011 Census: Key Statistics". Office for National Statistics. Retrieved 20 July 2015. ^ "Home Page - Seaham Town Council". Seaham.gov.uk. Retrieved 15 May 2018. ^ Pevsner, N., The Buildings of England: County Durham, Penguin Books, London, 1953/1983. ^ Ryder, Peter F. "Detailed description and history of the Church of St Mary the Virgin, Seaham" (PDF). The Diocese of Durham. ^ Hyde, H Montgomery (1979). The Londonderrys A Family Portrait. Hamish Hamilton. ^ "The George Elmey Lifeboat Lifeboat Restoration Project - Remember the Heroes". Seaham.org.uk. 17 November 1962. Retrieved 28 June 2014. ^ "New name for rebuilt £14million school". Retrieved 6 March 2018. ^ "Alien3 film locations". The Worldwide Guide To Movie Locations. Retrieved 11 November 2016. ^ Jones, Robin (2014). Lighthouses of the North East Coast. Wellington, Somerset: Halsgrove. ^ "Sculpture of British Tommy reflecting upon the horrors of World War One during the first minute after peace was declared installed for centenary". Daily Mail. 30 May 2014. Retrieved 1 September 2014. ^ "Seaham Tommy 1101: Town raises funds to buy sculpture". BBC News - Tyne & Wear. BBC. 26 July 2014. Retrieved 1 September 2014. ^ "Constituency profile: Easington". The Guardinan. Archived from the original on 28 May 2014. Retrieved 13 May 2014. ^ "Election 2010 – Easington". BBC News. BBC. Retrieved 19 April 2013. Wikimedia Commons has media related to Seaham.